Bob has taken his high-end, mirror polished knives and simplified them. He has changed the brilliantly polished CTS-40CP steel to our famously heat-treated D2 steel with a fine satin finish. And just as impressive as the knife, he fits each one with his high quality leather sheath. I began making knives when I was a boy, learning from my grandfather how to forge files and springs into useable knives. In the early 1960’s I was making and selling roughly made knives that local hunters in central Louisiana liked. They like them because I made the steel harder so it would hold an edge even with rough use. 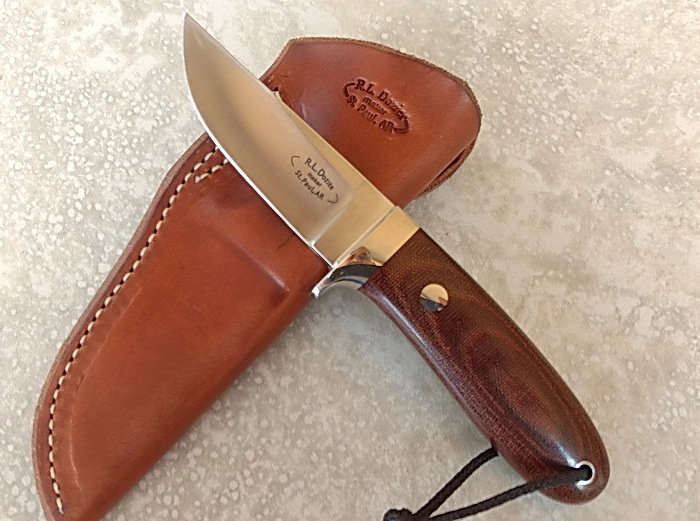 In 1965 I began reading the articles in the gun magazines and Gun Digest by A.G. Russell and by Ken Warner, and realized that there were other people out there making knives. Seeing knives made by other people, led me to reach for new levels of fit and finish in all of my knife work. This was during a time when knifemaking was beginning to change; Al Buck had turned from being a knife maker to owning a factory; W.D. Randall had 15 to 20 men making his knives; Bill Moran, Harry Morseth, and a few others made up the entire world of handmade knives. By 1971, I was made to feel that I fit into the top levels of current knifemaking. Bob Loveless had come from nowhere to become the most respected name in knifemaking. Articles on knives were appearing everywhere, and I was mentioned in most of them. In late 1971, A.G. Russell, the leading figure in knife sales, asked me if I would be willing to come work for him and to help in saving the Morseth knife company from extinction. I saw this as an opportunity to learn more about my craft, and indeed, in the next three years I made as many knives as one man could be expected to make. I finally experienced what is now called “burnout”, left knifemaking and went back to my work as an ironworker. As I traveled the eastern half of the United States doing ironwork, I carried my knifemaking equipment and managed to make a few dozen knives a year. Just a few years ago, I returned to make the Morseth knives for A.G. Russell, and now have my own knife making business. I find that I would much rather make basic hunting knives from the highest quality tool steels at very reasonable prices, for people who will use them, than spend expensive time hand rubbing a finish for collectors. I will probably make a few fancy knives each year, but my heart is with the knives you see online.